Recently, Polly #3 visited the beautiful city of Chicago and before she went, she was told that she had to try three things when she was there….Chicago Deep Dish Pizza, Chicago Popcorn, and of course, a Chicago Dog! What? You’ve never heard of a Chicago Dog! In a word, they’re awesome! Located at 26 E. Randolph Street in “The Loop”, America’s Dog serves a humdinger of a Chicago hot dog, in fact, their sign says that they are voted the #1 hot dog in Chicago! A pickle on a hot dog? Of Course! That's how they do it in Chicago! Okay, okay….I know you can’t take the suspense any longer! Available regular or jumbo-sized, a Chicago Dog is topped with mustard, relish, onions, sport peppers, tomatoes, and celery salt. The finishing touch is a pickle spear snuggled inside the already crowded bun! This culinary delight is sure to please, but make sure you grab a big stack of napkins before you take your first bite. A Chicago Dog is tasty and messy! Polly seems to be on a roll (no pun intended)with hot dogs lately….check out the red hot dogs she discovered in Maine this summer! I don’t know about flies, but weinerschnitzel and kraut sounds good. What precisely are sport peppers? That’s one hungry looking frog! I don’t agree with the hot dog taste, but I do with the pizza! I love Chicago Deep Dish Pizza because of the pepperoni,sausage,and cheese. I do not like the Chicago Dog because everthing on it but the hot dog! I was in Chicago this summer. I liked the Willis Tower. I’m voting with Collin–that pickle spear would ruin the hotdog. Chicago pizza, however, is really good. 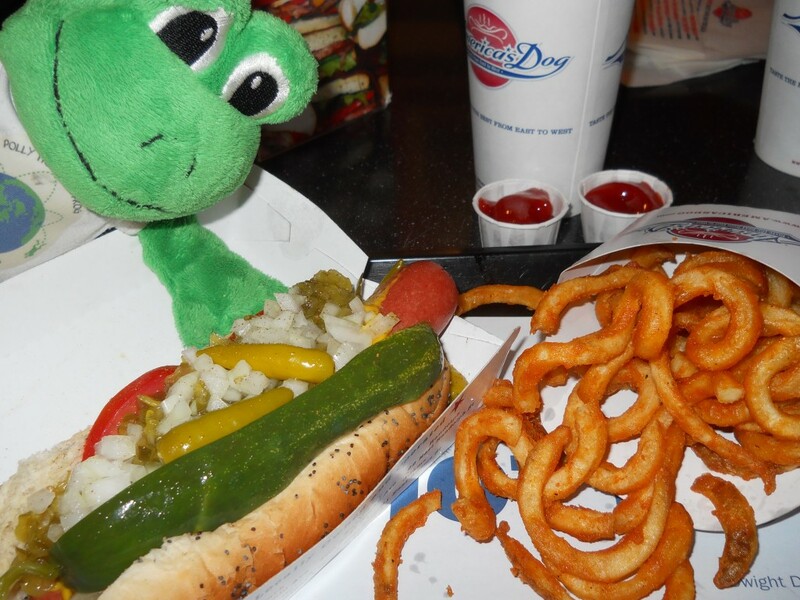 KEVIN T….the Chicago Dog is great, pickle and all! Who ever hates pickles! I love pickles I also like relish, onions,mustard,and tomatos. Madison…The hot dog was very big,in fact, it was jumbo sized and the toppings made it taste very good! lms..thanks for writing! We should write a ‘I love pickles’ post! I liked the picture. It was funny. That is one big hotdog! We bet it was great:) How much did it weigh? Did you like the trip? I don’t know how much the hot dog weighed, but let me tell you, it was BIG! I loved visiting Chicago. It is a beautiful city and I would love to go there again someday! It looks like a quarter-pound hotdog to me. Well…we could love make a I love pickles post.P.S In fact IIIIII LLLLLLLLLLLOOOOOOOVVVVVVEEEEE PPPPPPIIIIICKKKKKKLLLLLESSSS!!!!!!!!!!!!!! Pickles are green just like me! I love pickles! It was VERY tasty! Chicago Dogs are great! Polly do you have fun traveling? Dear Mrs.Schneider, I am so sorry I said that. Did you ever eat a Chicago dog before? I like the chicago dog. Was it good? It looks good. First of all, thank you so much for visiting my website! Polly loved the Chicago hot dog! 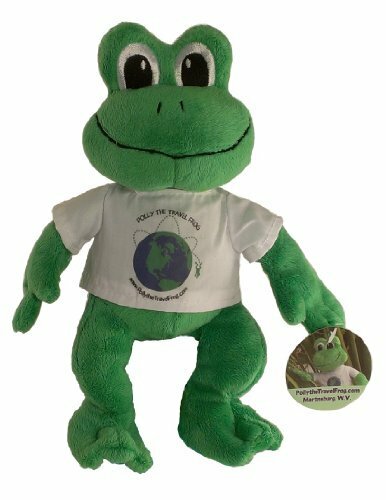 I bet you didn’t know that Travel Frogs like to eat hotdogs! Check her out in Maine…she ate a red hot dog!